For Mary Kay Kusner, priesthood wasn’t an option — until she had an out-of-body experience. Full Circle is a small Catholic church in Coralville, just outside Iowa City. It only has a few rows of chairs; about 20 people fill them. Everyone knows each other. They greet one another with warmth then settle in their seats, which is when Mary Kay Kusner walks to the front of the room. She’s in her white robe. She stands at the altar, stretches out her arms, then calls the Mass to order. There’s a lot to squeeze in today. Eight children are scheduled to be baptized, and the air is filled with excitement. The kids can’t sit still; they’re constantly getting up from their seats to take a stroll down the center aisle. It’s casual; Kusner doesn’t bat an eye. Even when one of the younger kids breaks down in tears, she simply smiles and continues her service. When it’s time, Kusner calls the children to the front of the church. One by one, they’re held over a font of water as Kusner gently pours a trickle over their heads. And with that, the children become one with the Roman Catholic Church — at least, that’s how the Roman Catholic Womenpriests see it. Before Kusner even thought about the priesthood, seven women from Germany, Austria, South Africa and the United States met on a ship on the Danube River in 2002 to become the first women priests in history. Rómulo Antonio Braschi, an Argentine Catholic bishop, performed the sacrament. The Roman Catholic Womenpriests (RCWP) consider this act to be their founding. The Roman Catholic Church considered it something else, namely a sin. The Church was built on the idea that only men can be priests. It’s been that way for 2,000 years. The Church’s guidebook for believers, the Catechism of the Catholic Church, even states that, “The Lord Jesus chose men to form the college of the 12 apostles, and the apostles did the same when they chose collaborators to succeed them in their ministry.” Once a boys club, always a boys club. So when the seven ordained women — now known as the Danube Seven — tried to persuade their local priests and bishops that they should be treated like any other clergy, those priests and bishops, as well as the leaders of the Catholic Church itself, refused. It demanded the women repent for their sins or face punishment. The Seven said no, and were excommunicated in 2003. But that didn’t stop them, or the movement. The Danube Seven spread the gospel. They also spread the women priest movement, first across Europe and then, only a year after their ordination, in the United States. There was even an official U.S. organization, Association of Roman Catholic Women Priests (ARCWP), to promote equality for all within the Catholic Church. The group claims discipleship through the Holy Spirit, doesn’t acknowledge a gendered God and doesn’t require celibacy. Now there are over 120 women priests and 10 female bishops around the world. At first, male bishops ordained the women, but as female bishops gain ground, they, too, are beginning to ordain other women. Kusner was brought to the priesthood in 2010 by one of the original Seven: Patricia Fresen. Kusner said she watched from outside her body as it got up from its seat and walked to the front of the room. Once there, a cluster of people gathered around her. They raised their hands and blessed her. That’s when Kusner felt her spirit re-enter her body. With the help of Bishop Regina Nicolosi, she’d gone from a parishioner in the back of the room to an ordained Catholic priest on June 13, 2010. It was also the moment the Catholic Church claims Kusner was damned to hell. “That to me was probably the most powerful experience I’ve had of feeling called (to priesthood) and having the community bless that call,” Kusner said. Kusner, an Ohio native, had always been a strong Catholic. She was raised by two staunch Catholics and had hopes of one day becoming a nun or a missionary for the Catholic Church. Kusner chose to continue her journey of faith by attending a Jesuit college and studying the pastoral ministry. 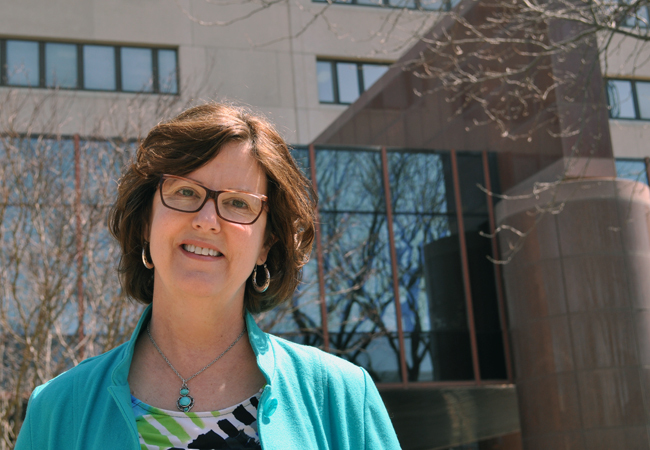 After graduating from John Carroll University in Cleveland, Kusner moved on to Boston College to work toward her master’s degree in pastoral ministry. While there, several of Kusner’s female peers became Episcopalians to become ordained. But it wasn’t Kusner’s dream to become a priest; she was content in leading a good, Catholic life and spreading the faith. It wasn’t until she joined Iowa City Hospice as its first chaplain that she began to question. The Catholic Church doesn’t care for the ARCWP much — and not just because the group wants more women to become ordained. The ARCWP breaks with traditional doctrine on several big issues. The first: If women and men are created equal by God, they should have equal rights in the church. Second: The ARCWP also preaches inclusiveness of all people regardless of race, gender, class and sexual orientation. The Catholic Church rejects homosexuality on the grounds that it is not complementary to the human body and is not capable of procreation. Celibacy is another issue that differs between the women priests and the Roman Catholic Church. It’s traditionally believed that Catholic priests have always been unmarried and celibate based on St. Paul’s teaching in the Bible. That’s actually not the case. The teaching only came about after the 11th century and still has not caught on in some areas. Eastern Rite churches, for example, are recognized by the Roman Catholic Church as traditionally Catholic, but they practice several sacraments differently and allow priests to marry. The ARCWP says there’s no connection between celibacy and the priesthood and doesn’t require its women to remain celibate. The Roman Catholic Church might be inching toward the same point of view. On Feb. 27, 2014, a man in California, Wissam Akiki, became the first married priest in the U.S. — with permission from the pope. Even so, the ARCWP remains controversial on other issues, including its support for birth control, its fight against sexism and its desire to tear down the hierarchical structure of leadership within the Catholic Church. But the biggest schism between the ARCWP and the Catholic Church remains the role of women in the priesthood. The Church is steadfast of this. Monsignor Frank Bognanno, from the Diocese of Des Moines, has been a priest for about 49 years and says female priests are just not theologically possible. The informal structure and inclusiveness of the women priest movement has led to a slow migration of parishioners from traditional Catholic churches. Jim Pettitt is one of them. A Catholic from birth, he’s become a part of Kusner’s flock for his daughters. “We have four daughters and, not that any of them were aspiring to be ordained, but they felt discriminated against because the Catholic Church institutionally does not allow women to become priests or deacons,” Pettitt said. That also puts a heavy burden on the men in the Catholic Church to take up the priesthood — something fewer and fewer are doing. Since the 1960s, the number of men entering the priesthood has dramatically decreased. Using data collected from 1899 to 1999, the University of Wisconsin discovered a pattern. Every four years, starting in the 1960s, the number of men entering the priesthood decreased by approximately 45. They predict that the U.S. alone will lose 16,000 potential priests by 2015. By not allowing women to join the priesthood, the Catholic Church may be missing out on a valuable resource. “There’s a shortage of male priests, so why wouldn’t they change their philosophy and bring in women and married men?” Pettitt asked. As the RCWP parishes continue to grow, so will the push toward a more inclusive Roman Catholic Church. It is the parishioners that will make the difference. More of them are calling for women in the priesthood, and the women are answering their calls. Kusner’s push came from members of her faith community, with whom she was sharing faith-filled community gatherings. Originally, members of the church would come together for small faith community gatherings in their homes. Eventually these gatherings included sharing communion, using hosts that were consecrated by a priest prior to the event. But eventually, Kusner and those who attended the group prayer services began to feel perturbed by the inconvenience of having to have the hosts consecrated before their meetings. “From that we thought, ‘Wait a minute, why aren’t we doing this as a community? Why aren’t we saying the words of consecration?’” Kusner said.